John’s Note: If you live in a state where the lakes remain frozen in February, these techniques for catching February bass and crappie certainly won’t work. But if your state has open water during the month of February, the size and the number of bass and crappie you take may surprise you. Anglers can catch some of the biggest crappie of the year on Lake Eufaula on the Alabama/Georgia border near Eufaula, Alabama, during February. “During a day of fishing, if the weather is right, two anglers can limit out with crappie that will weigh from 1- to 2-1/2 pounds each in the mouths of the creeks here at Lake Eufaula,” says Jackie Thompson, a guide on Lake Eufaula for 32 years, who also fished the Chattahoochee River before the impoundment of Lake Eufaula. 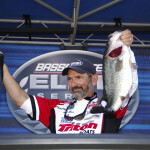 To contact Jackie Thompson at the Lake Eufaula Guide Service, call 334-687-9595 or visit www.alabamabasstrail.org. 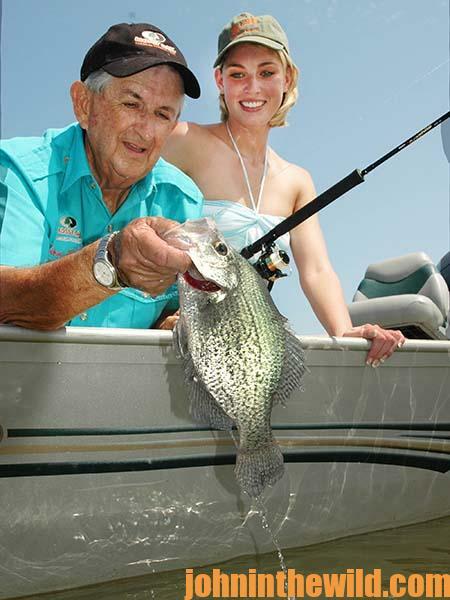 Often crappie fishermen can’t find and catch the big slabs at Eufaula, because they fish too shallow and/or fish in the wrong places. 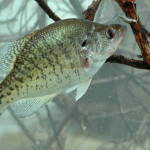 “Our crappie will concentrate in 15 to 20 feet of water holding from the mouth of the creek to about 100 yards inside of the creek,” Thompson explains. 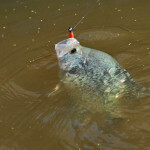 “One of the biggest mistakes that crappie fishermen coming to Lake Eufaula make is they will fish in treetops and brush that’s only in 8 to 12 feet of water. This time of the year you need to fish the open water and rely heavily on your depth finder.” Thompson uses his depth finder to actually see the large schools of crappie in the mouths of the creeks and in that first 100 yards inside the creek mouths. “Cowikee, Wylaunee, Bustahatchee, Cheneyhatchee and all the major creeks will have plenty of crappie in the mouths of them,” Thompson reports. Once Thompson sees the schools of crappie and knows the depths where they hold, he then sets out four to six rods and trolls through the schools, barely bumping his trolling motor on, to make the boat move as slowly as possible. “On one rod I’ll just have a jig, on another rod I’ll have a jig tipped with a live minnow, and on another rod I’ll have only a minnow,” Thompson explains. He uses these three different rigs on each of his six rods to cover more of the water segment. 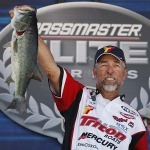 Thompson ties a jig 18-inches from the bottom of his line, another jig 18-inches above the first jig, and then 18-inches up from the second jig, he ties the third jig or ties on three hooks, if he’s just fishing minnows. 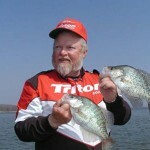 With six rods out at varying depths, the rod that gets the most bites or catches the most crappie will tell Thompson at what depth to fish and what type of bait the crappie prefer on that day. “Once I’ve identified the kind of bait and what depth I’m catching the most crappie at, then I’ll change all my rods to fish the same way as the rod that’s the most productive,” Thompson advises. 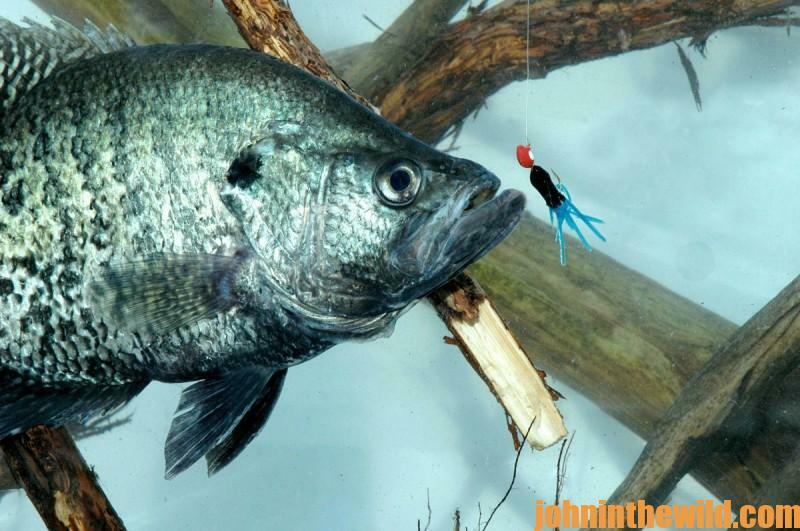 For more crappie fishing tips, get John E. Phillips’ Kindle eBook “Crappie: How to Catch Them Fall & Winter,” or get “Crappie: How to Catch Them Spring and Summer.” Click here to get these books.